After recently offering an introduction on how to build a Diamond Dynasty team on the cheap, it quickly became clear there was still more advice to impart on specific role players who can become invaluable when going toe-to-toe with people online. Best of all, these cards can be acquired for a relatively affordable number of stubs. With all of those coveted diamond cards commanding as much as six figures on the marketplace, you don’t have to blow your entire wad to compete with squads who have managed to stack their lineups with these intimidating diamonds. Instead, you just have to think outside the box a little bit and find creative ways to use all of the different tools baseball players can possess to fight all of those Goliaths out there with your very own Davids. Trust me when I say there are few feelings more satisfying in MLB The Show 17 than managing to take down a team full of superstars and legends with a rag-tag group of misfits that you’ve thrown together like some kind of inspirational sports movie. One of the best ways to wreak havoc on a seemingly superior opponent is by terrorizing them on the basepaths. It’s increasingly difficult to control the running game, and even with pitchers using pickoffs, pitchouts, slide steps and varying the timing of deliveries, it still won't always stop a flurry of stolen bases. That’s why these are some great options to drive people mad on the mound. And even if you don’t steal a base, you might still get in the pitcher’s head enough to make him throw a bad pitch down the middle of the plate or a wild one that allows your runner to move up a base without even needing to steal it. In addition to being incredibly quick, Gordon also hits for contact really well. He may not possess all that much power, but who needs power when he’s turning that single into a double or triple with a well timed bag swipe or two. Unlike Gordon, Hamilton doesn’t have the same kind of ability to get on base with his bat as Gordon, but once he does, he’s pretty much a pitcher’s worst nightmare. This means he may not be worth putting in your starting lineup, but he’s definitely someone you want to at least have on your bench so he can be used as a pinch runner when the game is on the line. Or, you could always use his 99 drag bunting ability to help get him on base. There’s nothing quite like a home run in a big spot to demoralize an opponent and there’s no shortage of cheap players on the market that can help you out in that department. Having players with a little pop in their bat in the middle of the order is a great way to bring home some baserunners and quickly make up any deficit on the scoreboard. It’s hard to find power attributes like these even among the legends of the game, let alone from the bargain bin of the marketplace, which is what makes someone like Encarnacion so valuable. Sure, you’ll have to accept some of his other shortcomings (like subpar fielding and speed, namely), but when he’s mashing monster homers it’s unlikely you’ll be caring too much about any of those deficiencies. Like Encarnacion at first base, right field is another position where it’s nice to stash a power hitter without having to worry too much about fielding ability, and Trumbo will provide that kind of superior power in spades. One of the big changes this year in Diamond Dynasty was not allowing teams to see the handedness of the opposing pitcher so squads that had stacked their lineups with left-handed hitters couldn’t back out of games once they saw that they were facing a lefty on the mound. On the occasions when you are facing a left-handed pitcher, it’s nice to have someone you can call on who specializes in hitting southpaws, even if they maybe aren’t in your starting lineup at the outset of a game. The switch-hitting Martinez isn’t all that bad against righties either, but he becomes an even tougher out when facing lefties. It’s this kind of versatility that makes him (and many other switch hitters, for that matter) such a valuable asset in the game this year. His advanced age may mean he’s slow as molasses and just an average fielder, but it’s a small price to pay for someone with the kid of specialized skills he has at his disposal. Since the Tigers have the kind of lineup that’s essentially built to give lefties fits, don’t forget about Victor’s teammate. He’s a little more expensive than Victor on the market, but he’s also a bit more of a well-rounded player, so he may be worth the extra stubs if you have them to spend. While we’re on the subject of lefties, it’s also worth considering that having a left-handed starter or two (or even three or four) can be the perfect neutralizer to any lineup that has still chosen to go heavier on left-handed hitters despite the changes to the mode this year. Paxton is hardly the cheapest lefty available, but you’ll be hard pressed to find a gold card for a lefty starter at a lower price than this. He’s also currently beginning a rehab assignment in real life so he won’t be subject to any dips in his rating courtesy of Inside Edge for the next week or so, and if he continues to perform the way he did prior to getting hurt this year, he might even end up getting a bump in his ratings before too long. Another starting lefty with a sub-2.00 ERA this season, Wood has been fantastic for the Dodgers thus far and has been getting some favorable Inside Edge boosts as well. With the running game being such a big factor this year, the one position where you can really use someone with superior defensive skills is at catcher. This is one reason why you see so many people online using their created player at the position. If you don’t want to do that though, there are some affordable alternatives to be found on the market. Aside from being a pretty good hitter in his own right, Molina is also one of the best in the game at blocking pitches in the dirt behind the plate and throwing out baserunners. He’s pretty much the top option available to keep the running game in check without sacrificing too much at the dish. While Molina is slightly cheaper and probably a little bit better of an all-around hitter than Perez, there are some things that Perez can bring to the table that Yadi cannot. For instance, his arm may not be quite as strong but it is more accurate, and he can also hit for more power at the plate. If you don’t have the stubs to shell out for the most premium relief talent, sometimes the best substitute is a pitcher with the kind of wonky delivery that can drive hitters crazy. 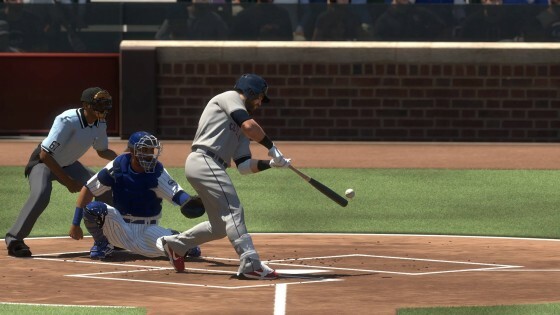 And if you thought that a side-armed release point was tough to face for hitters in real life, it’s even more frustrating for those video game batters at home. O’Day’s side-armed delivery would be difficult enough to face even if he didn’t have nasty stuff as well. Complementing a slider that can move all the way from one side of the strike zone to the other, he also has at his disposal a fastball to keep hitters honest, and an above average sinker. Neshek is quite similar to O’Day in his esoteric submarine delivery style and even has the same kind of slider with wicked movement. He also has a sneaky good changeup that is so slow it becomes nearly impossible for hitters to hold back on once they have been fed a steady diet of harder stuff. There are a lot different ways to win a baseball game, and much like real-life clubs, if you don’t have the kind of capital to shell out for superstars that can do everything well, you can at least cobble together a group of players that bring their own particular set of skills to the table. When employed correctly, they can serve as catalysts to winning games against better opponents by utilizing their specific strengths. If you have a little extra the most consistent HR hitter for me has been Kyle Seeger. His brother Corey gets all the attention but Kyle has been clutch. You can definitely win with a budget line up just have to play smart especially against decent players with an all diamond team. Great article. I am going to have to buy some of these players for my team. Nice article. Paxton has been back up in the bigs for a start already. Lucas Giolito. Love pitching with him. I agree. Awesome article and you're right on with most of those picks. In the bullpen I also really like Devensky (sp) and Melancon as a closer.